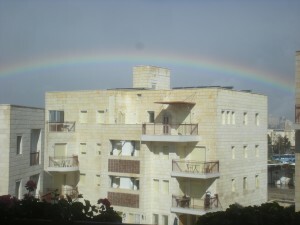 Jerusalem rainbow, as seen from my apartment this past week. This will just be a very brief post to check in on a few things. I owe you a few posts right now: two tiyul (trip) reports to write up (Ein Gedi and Modiin vicinity), and a few class updates as well. I also have a bit of catch-up to do on the tourism business in general, and a post or two about things I’ve seen/done in Jerusalem lately. I’ve just been very busy, trying to get everything done and also stay up to date with my reports for each tiyul.